The family headed up the day before and spent the night in Duncan with Nana and Grandpops. In the morning, Janelle and I left the kids behind so that we could go to the race. We left Duncan a little late. We actually were on time, but then my mom said that we needed gas in her car, so that put us behind somewhat. Anyways, we got to the race in ample time. I checked in and got my race number on. The setup inside the gym looked nice. They had some wicked post-race nutrition, including waffles and strawberries. Yum-yum. But, I never had any as it turned out. While I was warming up, the usual suspects were entered in this race. The Frontrunners Boys were present, as were many of my Harrier training partners. I was a little concerned about the distance. A 12k race is a funny one. It isn't short, it isn't long. It's a distance that will confuse you. My goal going in was to treat it like a half-marathon,and then to save some extra energy for the hills. There were two big hills, and both were close to the finish line. I lined up on the start line and looked up. I saw a parked RV about 15 meters infront of me - a parked vehicle that should have not been there. If I were to run straight, I would run right into it. So I decided to go around it the other way - off course slightly. The move paid off. I didn't have anyone close to at the start. I found my pace, and stuck to it. As usual, the elite pack took off and I snuggled into a solid 3:45/km pace. The course was hillier than I imagined. I was told prior to the race that there were "rolling hills", but these were just plain hills. It also turned windy around the 5k mark, however I did not let up. I was not passing anybody, but at the same time, I was not being passed. 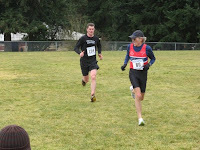 The turn-around spot was at 7k, and I felt quite good still. 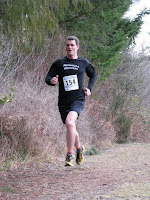 I maintained a pretty good pace until I got to the final 2 uphills, which were steep for a road race. However, I am good at hills, and I passed 2 people on them. 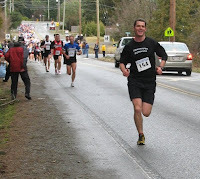 In the final stretch, I was passed by Brian Connan. He is 62 years old, and pulls in elite times relative to his age. On the final grassy stretch coming into the school, I felt like I could catch Brian. I sped up and pushed him to go even faster. As he turned his head, he saw me and then he put in one last kick to beat me. This was alright. I knew I didn't have an earth-shattering race, but I knew it was decent. When the results trickled in, I came in 32nd place. 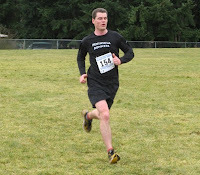 The race had 381 entries, so once again, it was a top 10% finish.